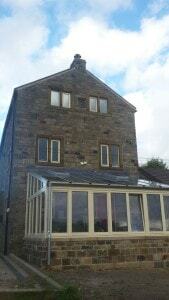 Cumberworth radical retrofit: It’s a wrap! We’re really pleased with how our Cumberworth project has gone. Energy consumption, as modelled in PHPP, has gone down somewhere in the region of 80-90%. The airtightness has radically improved – from 17 air changes per hour to 2. Our clients are loving being back in their warm and cosy ‘new’ home. It looks lovely too, especially with the addition of the new conservatory (outside the thermal envelope) adding extra light and space. When we embarked on this project we committed to getting the air changes down to 3 ach/ hour. We had an airtightness blower door test recently and it came in at 2.5 air changes/ hour @ 50 Pascals. 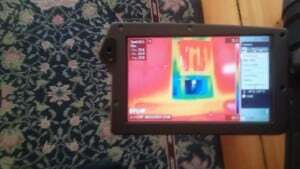 We went around the house with a thermal imaging camera we found that there were two areas that were a problem although otherwise the house was extremely airtight. 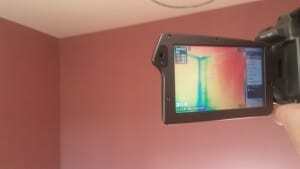 The thermal imaging revealed a problem at the large full height partition wall, which is the old barn gable end wall. We should have treated it as if it was an external wall, because of lateral air movement from the external walls, which are rubble-filled and causing air movement. We had airtightness measures in place on all external walls BUT we didn’t do the same level on the partition wall. We did parge the partition wall for a metre from the junction with the external wall, including a 400mm layer of Tectem insulation to stop thermal bridging and condensation forming. We should have parged the whole of the partition wall, including around the doorways. Another area we should have looked at was the airtightness around the floor joists going into the partition wall on the two floors. We could have taped the joists with Tescon No 1 tape to the parged walls OR we could have chopped off the joists and used wall plates (as we did at the Denby Dale Passivhaus) and hung the joists off them. As we develop our understanding of radical low energy retrofits we are on a steep learning curve and learning on each project. We are becoming more and more perfectionist and any air leaks now feel disappointing so I am kicking myself about the partition wall as we should have been able to foresee the problem. I think we took our eye off the ball because we were focusing our attention more on the moisture and IWI issues. So..it’s a lesson… We are unable to remedy the issue at this stage as it would be too intrusive and too costly and perhaps unnecessary. Fortunately the second issue was something that we could address. When I teach on the CarbonLite CEPH course we always stress the importance of scepticism regarding manufacturers’ claims but unfortunately on this occasion I didn’t follow my own advice. We chose a wood burning stove for the project that was marketed and labelled as ‘Passive’, with only a very small heat output of 4KW, which is what was needed. It had an external air supply which led us to believe the stove was room-sealed. But actually when we did the airtightness test it was leaking the equivalent of up to 0.5 air changes an hour. When we disengaged the stove, flue and supply pipe, and re-did the air test the results came in at 2 ach/ hour, rather than the 2.5 ach/ hour with the stove. To remedy this we put a call-out on Twitter asking our colleagues in the Passivhaus community for alternative options. Two alternatives were suggested. The Rika Passivhaus stove is airtight and has been installed at the Acomb project in York. The Morso S11 stove also can be suitably airtight, but only after adaptations to the airflow control, and has been used on an EcoArc Passivhaus project in Cumbria. We have managed to get a full refund on the original stove but we do feel that it is being mis-sold , due perhaps to lack of understanding about Passivhaus. We subsequently found a reference to its lack of airtightness in the stove’s installation instructions, so they’d obviously come across the problem, but this has not transferred over to their marketing department. We have chosen to replace it with the Morso S11 because it fitted in the aperture that we’d built. The Rika was too big and we’d have had to do a lot of building work to fit it in. The Morso S11 has actually turned out cheaper than the original stove! Given the many challenges at the house, we had assumed that the retrofit would never reach the EnerPHit standard. As we weren’t going for certification, our initial PHPP modelling only used assumptions and educated guesses for Psi values (edge losses). The modelling in PHPP suggested that, once improved, the space heating need will be in the region of 65 kWh/m2/ year. This contrasted with the space heating need of the original house , which would be in the region of 497 kWh/m2/year, assuming that the house was heated at a steady 20 degrees in the winter. So the space heating need is looking like an 86% improvement! The end result is wonderful – a warm and comfortable home for our clients with better airtightness than we originally thought we’d achieve. Congratulations to Jude and all the team for doing such a great job and also a massive thanks to our wonderful clients Sue and Paul for allowing us to try out a ‘whole house’ radical retrofit with a number of new IWI techniques and materials. We will be sharing updates of the ongoing HydroTrac moisture level monitoring and post-occupancy monitoring of the building. Watch this space! Would be interesting to calculate how much energy it takes to heat the 0.5 air changes an hour that the 4 kw morso wood burn stove would have drawn into the house from outside. Given that the incoming air would be at outside temperature and damp. its probably in the order of 0.5 kw/hr maybe? We have a morso squirrel that I modified so that the secoundary burn air comes from outside the house rather than from inside and it made a huge difference to the temperature / comfort of the room. The new secondary air burn wood burning stoves appears to use large volumes of air which comes from outside the house and need heating. This must reduce the over all efficiency of wood burning stove back towards open fireplaces, I imagine the official efficiency figures of wood burning stoves don’t take heating all this secondary air into account. It would appear there is still lots most wood burning stove manufactures could do to improve efficiency of their stoves? Anyone have any comments? If I have understood you correctly, this is an angle I hadn’t considered. I am assuming the benefits of overall house air tightness from a good room sealed wood burning stove far out way having an open flue system where the supply air is pre heated by default. MVHR efficiencies are crucially connected to good overall air tightness. And of course safety is paramount; there must be no risk of carbon monoxide! Interesting how ‘stuff’ can catch you out! You may recall I emailed you a while back about Teploties drooping, due to their weight, if left to hang out of one skin of a cavity wall before the other skin is built up to support them. I also have a Morso S11 and was off site when it was fitted. Much later, after a borescope inspection, I found that the air supply duct had been connected to the the back of the midi plinth and not to the spigot under the base of the fire. As there is a small gap between the fire and the plinth, cold air gets into the room when the fire is not lit. This costs me energy and will have to be fixed but otherwise I’m happy enough with my 21 kWh/m2/ year total energy usage for a non-PassivHaus. Sorry but I have not seen your previous e mail on drooping Teploties. No, there is no risk, the basalt/resin composition is relatively rigid but flexible enough to accommodate smallish variations in masonry coursing. As pointed out to me on Twitter this week, it would be interesting to know how much energy is lost through a room sealed stove by the continuous cold bridge of moving external air. Add to this the potential of overheating of the house (a 4Kw heating load when -10C outside) a wood burning stove looks inappropriate for Passiv or near Passiv houses. However, I do understand the attraction and poetry of real flames, and as has been pointed out to me, the wood burning stove is good back up for any breakdown of the primary heating system. Green Building Store's ULTRA & PERFORMANCE window ranges were specified for Carbon Coop's pioneering ‘deep retrofit’ Community Green Deal programme.